I just can't help my sanrio obsession. Normal people like my brother will never understand why I do what I do, but, you sanrio addicts, understand every time you go in a sanrio store or get a sanrio product in the mail. Basically, I just ignored my brother's attitude toward my sanrio collection and started opening my packages. The first package that I opened was my pretty 22" Hello Kitty plush. Instantly, I knew I made the right decision to buy this plush. Before I bought this plush, I didn't know if I would like the yellow and red combo color scheme. But after pulling it out of the package delivered box, I can tell you that this plush will stay in it's plastic. Yup, can't let the dust and dirt effect the condition of this brand new plushie. 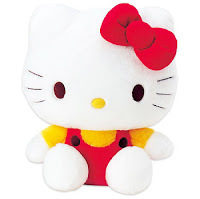 This plush is definitely on my list of important sanrio stuff and might end up in a big bin until I am ready to have it fully displayed one day. Same goes for my other two new plushes I got today. Both are My Melody. One pink and the other is red - just different kinds of plushies. They're not the same. Pictures of my new plushies will be posted either on Saturday or on Monday.